If you’re into sports, you’ve seen it happen. You’ve probably even experienced it: Rugby players patting each other on the back whilst walking through the tunnel after knocking each other around. Tennis players leaping over the net to shake hands with their opponents after a hard-fought match. footie players exchanging jerseys after an intense 90 minutes. Even boxers touching gloves at the beginning of each round, then hugging each other after beating each other into a pulp for 12 rounds. It seems like competitors in every event, from spelling bees to hockey, behave this way. What’s going on? It’s all part of sportsmanship, a great tradition in sports and competition that means playing clean and handling both victory and defeat with grace, style, and dignity. Some people define good sportsmanship as the “golden rule” of sports — in other words, treating the people you play with and against as you’d like to be treated yourself. You demonstrate good sportsmanship when you show respect for yourself, your teammates, and your opponents, for the coaches on both sides, and for the referees, judges, and other officials. But sportsmanship isn’t just reserved for the people on the field. Administrators, fans and parents also need to be aware of how they behave during competition. Sportsmanship is a style and an attitude, and it can have a positive influence on everyone around you. Everyone feels great when they win, but it can be just as hard to be a good sport when you’ve won a game as when you’ve lost one. Good sportsmanship takes maturity and courage — when you work really hard at a sport, it’s not easy to admit you made a bad play or that someone has more skills than you. In competition — as in life — you may not always win but you can learn something from losing, too. It’s pretty tough to lose, so it definitely doesn’t help matters if someone continues taunting you or your team after the competition is over. Sometimes it’s hard to swallow your pride and walk on. But there’s always the next match. When you do lose — and it will happen — don’t take it out on your opponent, blame the officials, or blame your team. Take it in stride. When you lose, lose with class. Being proud of how you performed, or at least being aware of things you need to improve for next time, is key. When it comes to losing, good sportsmanship means congratulating the winners promptly and willingly. Also, it means accepting the game’s outcome without complaint and without excuses, even if you sometimes might suspect the referees made some questionable calls. Stay cool. Even if others are losing their tempers, it doesn’t mean you have to. Remind yourself that no matter how hard you’ve practiced and played, it is, after all, just a game. Avoid settling disputes with violence. If you’re in a difficult situation or someone’s threatening you, seek help immediately from your coach or from an official. Remember, too, that if you respond with violence you could get penalized, which could hurt your chances of winning. Cheer your teammates on with positive statements — and avoid trash-talking the other team. When officials make a call, accept it gracefully even if it goes against you. Remember that referees may not be right every time — but they’re people who are doing their best, just as you are. It’s good to see that the rugby boys in Brunei are upholding these spirits …. For the first time in BRFU history, an Inquiry board sat down to discuss a dispute matter between 2 local clubs. Royal Brunei Yacht Club (Yachties) lost two points from their total points whilst Royal Brunei Police gained a point for the errors done by Yachties. To Consider: i) Rolling Subs; ii) Jersey swaps and iii) failing to submit Substitutes forms contrary to Rules of Competition and specifically the Substitution Rules that were made available to all teams. Considering this is the first ever Judicial Committee convened in Brunei Darussalam, the Panel felt that it had to ascertain and deal with a few procedural issues in respect of the convening of the Judicial Committee. Mr. Ainol Razman requested to sit in on the hearing as an observer on behalf of the BRFU and all parties did not have any objections to this. Mr. Ainol Razman was asked whether he, on behalf of the BRFU, had authorised for the Judicial Committee to be convened. He confirmed the same. ii) the composition of the Panel. There were no objections recorded. Parties were duly informed that the hearing will be heard in private in accordance with IRB’s Regulation 18 Appendix1. All parties were informed that they had a right to be heard and the Panel thanked them for sending their views and submissions. The Panel then informed all parties that they had convened as quickly as possible due to the ongoing Competition as the Panel felt that there were some very important technical issues to decide on for obvious reasons. Royal Brunei Police Force RFC (Police) played against Royal Brunei Yacht Club RFC (Yachties) on the 19th April 2008 at the Police home ground. The Match Commissioner prepared and sent out his report highlighting some possible problems and/or breaches of Competition rules/laws/regulations specifically in respect of i) Rolling Subs; ii) Jersey swaps and iii) failing to submit Substitute forms. The Police through Mr Johannas Hickey then lodged a complaint through the BRFU forum and was then advised by Mr Ainol Razman, on behalf of the BRFU, to lodge his complaint officially to the Chairman of this Panel. This was because all relevant BRFU committee members felt they were conflicted as they were involved in the said game. Mr. Johannas Hickey duly lodged the same with the Chairman immediately. The Chairman immediately convened a Judicial Committee to investigate into the complaint. The issues in respect of the jersey swaps and failure to submit substitute forms as highlighted by the Match Commissioner were duly admitted by the Yachties in their written submissions that were sent to the Panel. Rolling substitutions will only be allowed by the three designated front row reserves as we feel safety dictates this decision. So amongst the designated front row reserves on the match team sheet and the starting front row they can roll off and on at any time in the games unlimited. Whereas only 4 of the seven potential reserves left on the bench can only substitute for injury or tactical reasons. In that case most if not all situations will involve a permanent substitution unless covering a blood bin. All parties agreed that this rule is new to the competition and that it was drafted for the purposes of limiting “rolling substitutions” to designated starting and reserve front row players only. Therefore it is our opinion that due to the very restrictive nature in which this rule has been drafted and the intention behind such drafting, only designated front row players who start a game can be “rolled off” by designated front row reserves and when this is done properly and correctly the team doing so can enjoy the benefits of this rule without fear of adverse repercussions. Procedurally it is therefore imperative that the team sheet before a game properly highlight the designated starting front row and the designated reserve front row. What is not allowed or permissible is for a designated front row reserve to come on as a “rolling substitute” for any other player who is not a designated front row player who started the game notwithstanding whatever position he may have been playing at the time the designated front row reserve comes on. In the event this were to occur, this would certainly not be regarded as a “rolling substitution” but quite simply a normal substitution or possibly a blood bin depending on the circumstances. However, there is nothing then to stop him playing in the front row later on in the game, but due to the earlier substitution he would have lost his “right” to be regarded as a “rolling substitute”. Therefore, quite simply for the avoidance of doubt, “rolling substitutions” can only occur between designated front row players and no one else. Mr. Hickey agreed to this and said he had nothing else to add. Mr Mark Pyrgos did not contest this allegation and admitted to various breaches which were also highlighted by the Match Commissioner and also in Mr Hickey’s complaint. Mr. Mark Pyrgos and Mr Sukor Ashak put the fault down to the Yachties being badly prepared by not appointing their own substitute official before the game and correctly admitted to it being a mistake on their part. they undertake to “reinforce substitution procedures” within their own club. Due to their admission at first instance, we further considered this to be a mitigating factor. Kindly note that we have considered all other relevant mitigating factors although they may not have been stated above. Be that as it may, we also know for a fact that the Yachties had some very senior rugby playing members and committee members on the side line that afternoon. We further feel it necessary to comment that the Yachties absolute and total failure to ensure that their substitution procedures were in place properly before the game is not a good enough excuse especially considering the fact that many of it’s players and members present that day hold high office with the BRFU. With the wealth of experience within the club, we feel that they should be the standard bearers for other budding clubs to look up to. The Panel therefore felt that a sanction was necessary. We are obliged to Mr Mark Pyrgos for providing us some precedents for our consideration. The Panel in considering what penalty to impose did initially consider the harsh penalty of reversing the match result. But after further consideration the Panel decided that to be too harsh considering all the circumstances, especially the fact that the rule is very new to all parties and the need to encourage the development of the game in Brunei Darussalam. Deduction of two (2) points from the Yachties thus giving them three (3) points only for this match effective immediately. In doing so we did consider, further to the matters dealt with above, the fact that the “rolling substitution” offence did gain the Yachties an unfair advantage which may be prejudicial to the interests of the game in Brunei and especially to this ongoing competition. Awarding one (1) point to the Police thus giving them two (2) points for this match effective immediately. We considered, further to the matters dealt with above, the fact that the Police did make a comeback in the 2nd half of the game which could have gone their way had it not been for what happened. A serious reprimand to the Yachties to get their house in order and a caution that a failure to do so will attract a more severe sanction. In conclusion, the Panel are of the opinion breaching of competition rules is a serious matter which requires adequate punishment imposed on the offending party. However, being the first time this rule has been used and the fact that competitive rugby is at it’s infancy in Brunei Darussalam, we have decided to be more lenient on the offending party this time. We would like to convey our thanks to all parties concerned for their invaluable assistance in this matter. Belait Python – The defending Champion is the first team to qualify for the Darussalam Cup Playoffs. Good on you boys!! Here’s hows the table look so far. Psst… I’ve got a secret! Pssst … wanna know a secret? My body just can’t take the beating anymore. I guess its the age factor! Nevertheless, it’s good to see how the local boys are coping with the game. I put it down to the typical evolution of the game. Just like any other countries, this game was introduced by a group of ‘Rugby mad expatriate’ who are literally married to the game. Just like any marriage, they need offspring to carry on with their legacy, hence the introduction of the game to the locals. I remember the good ‘ol days when Yachties used to beat the crap out of any local teams, but the table has been overturned now. A cricket score in Seria last weekend was a prime example of the program’s success. Thanks to Tim and Zack who has nurtured these boys to become men. Petrus Tuan, Rudy Baja, Muhammad Ziyad, Habib Kamis, AK Muiz, Isa, Dinnie, Salihin Bujang, Abdul Aziz, Shariff Rasani and many more, are all below 25 and they have heaps of years to play the game competitively, and we hope that these boys won’t stop their involvement in the game, even as they have pass their ‘shelf life’ as the future of the game in Brunei really relies in their hand. They are the future Administrators, Coaches and Referees in the country. Based on the quality of the game last weekend (I was on the side line after 15 minutes of play … due to obvious reasons! 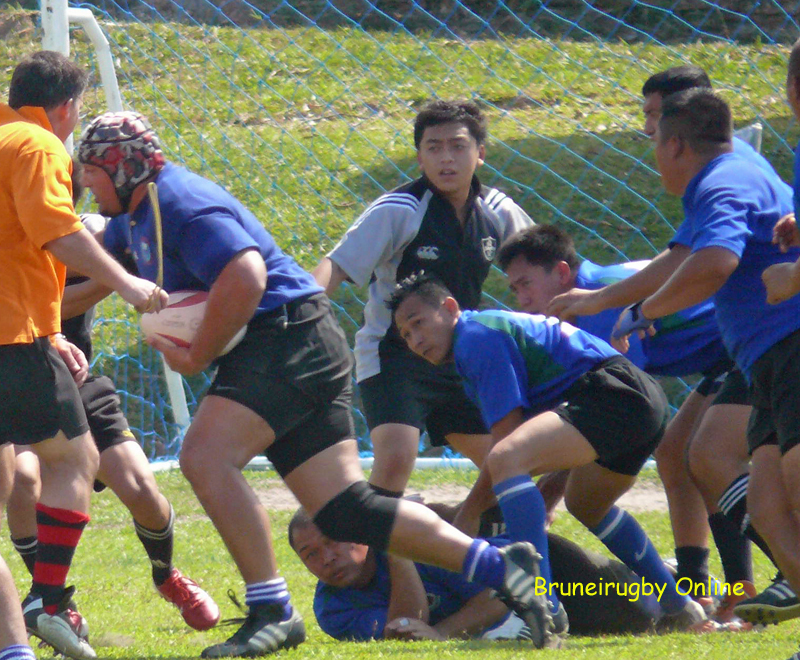 ), Brunei’s club rugby quality is not far off the quality of other rugby playing nation in the region. Give a year or two, I believe that these boys will be ready to take on the likes of Singapore, Malaysia and Thailand. But the crucial thing is that these boys MUST have the determination to succeed. We don’t want to be a ‘Juara Kampung’ (village hero). Psst … I’ve got another secret! There is a big chance BRFU is going to sign an agreement with a Guinness Premiere League Team! Author bruneirugbyPosted on April 17, 2008 April 17, 2008 Categories BitchingLeave a comment on Psst… I’ve got a secret! Royal Brunei Armed Forces were unlucky in their quest to earn the first win in this year’s competition . However, they managed to earn their first point through the loser’s bonus point when they lost 3-7. Here is the score table looks this week. What an Amazing opening week! Royal Brunei Armed Forces were unlucky in their quest to beat Royal Brunei Yacht Club for the first time in the competition and RBYC should thank their ‘Jonny Wilkinson’, Mark Pyrgos for his magical boots for the win yesterday. Two matches were played today. In the first game, Royal Brunei Police ran out of steam in the second half when The Knights proved that youth was superior when they lost 0-35 to the Knights. In the second game, KB Pythons continued with their superiority from last year’s tournament when they beat the Bandar Blacks 40-17.